THE 10TH ANNIVERSARY of the Supreme Court decision in Roe v. Wade is a good time for us to pause and reflect. Our nationwide policy of abortion-on-demand through all nine months of pregnancy was neither voted for by our people nor enacted by our legislators—not a single state had such unrestricted abortion before the Supreme Court decreed it to be national policy in 1973. But the consequences of this judicial decision are now obvious: since 1973, more than 15 million unborn children have had their lives snuffed out by legalized abortions. That is over ten times the number of Americans lost in all our nation’s wars. As an act of “raw judicial power” (to use Justice White’s biting phrase), the decision by the seven-man majority in Roe v. Wade has so far been made to stick. But the Court’s decision has by no means settled the debate. Instead, Roe v. Wade has become a continuing prod to the conscience of the nation. We cannot diminish the value of one category of human life—the unborn—without diminishing the value of all human life. We saw tragic proof of this truism last year when the Indiana courts allowed the starvation death of “Baby Doe” in Bloomington because the child had Down’s Syndrome. Over the first two years of my Administration I have closely followed and assisted efforts in Congress to reverse the tide of abortion-efforts of Congressmen, Senators and citizens responding to an urgent moral crisis. Regrettably, I have also seen the massive efforts of those who, under the banner of “freedom of choice,” have so far blocked every effort to reverse nationwide abortion-on-demand. What, then, is the real issue? I have often said that when we talk about abortion, we are talking about two lives—the life of the mother and the life of the unborn child. Why else do we call a pregnant woman a mother? I have also said that anyone who doesn’t feel sure whether we are talking about a second human life should clearly give life the benefit of the doubt. If you don’t know whether a body is alive or dead, you would never bury it. I think this consideration itself should be enough for all of us to insist on protecting the unborn. The case against abortion does not rest here, however, for medical practice confirms at every step the correctness of these moral sensibilities. Modern medicine treats the unborn child as a patient. Medical pioneers have made great breakthroughs in treating the unborn—for genetic problems, vitamin deficiencies, irregular heart rhythms, and other medical conditions. Who can forget George Will’s moving account of the little boy who underwent brain surgery six times during the nine weeks before he was born? Who is the patient if not that tiny unborn human being who can feel pain when he or she is approached by doctors who come to kill rather than to cure? The real question today is not when human life begins, but, What is the value of human life? The abortionist who reassembles the arms and legs of a tiny baby to make sure all its parts have been torn from its mother’s body can hardly doubt whether it is a human being. The real question for him and for all of us is whether that tiny human life has a God-given right to be protected by the law—the same right we have. What more dramatic confirmation could we have of the real issue than the Baby Doe case in Bloomington, Indiana? The death of that tiny infant tore at the hearts of all Americans because the child was undeniably a live human being—one lying helpless before the eyes of the doctors and the eyes of the nation. The real issue for the courts was not whether Baby Doe was a human being. The real issue was whether to protect the life of a human being who had Down’s Syndrome, who would probably be mentally handicapped, but who needed a routine surgical procedure to unblock his esophagus and allow him to eat. A doctor testified to the presiding judge that, even with his physical problem corrected, Baby Doe would have a “non-existent” possibility for “a minimally adequate quality of life”—in other words, that retardation was the equivalent of a crime deserving the death penalty. The judge let Baby Doe starve and die, and the Indiana Supreme Court sanctioned his decision. This was their majestic intheir babiesterpretation of the economy of the Universe. This was their lofty, and wise, and noble understanding of the justice of the Creator to His creatures. Yes, gentlemen, to all His creatures, to the whole great family of man. In their enlightened belief, nothing stamped with the divine image and likeness was sent into the world to be trodden on … They grasped not only the whole race of man then living, but they reached forward and seized upon the farthest posterity. They erected a beacon to guide their children and their children’s children, and the countless myriads who should inhabit the earth in other ages. Another example: two years ago, the Philadelphia Inquirer ran a Sunday special supplement on “The Dreaded Complication.” The “dreaded complication” referred to in the article—the complication feared by doctors who perform abortions—is the survival of the child despite all the painful attacks during the abortion procedure. Some unborn children do survive the late-term abortions the Supreme Court has made legal. Is there any question that these victims of abortion deserve our attention and protection? Is there any question that those who don’t survive were living human beings before they were killed? Late-term abortions, especially when the baby survives, but is then killed by starvation, neglect, or suffocation, show once again the link between abortion and infanticide. The time to stop both is now. As my Administration acts to stop infanticide, we will be fully aware of the real issue that underlies the death of babies before and soon after birth. Whether we are talking about pain suffered by unborn children, or about late-term abortions, or about infanticide, we inevitably focus on the humanity of the unborn child. 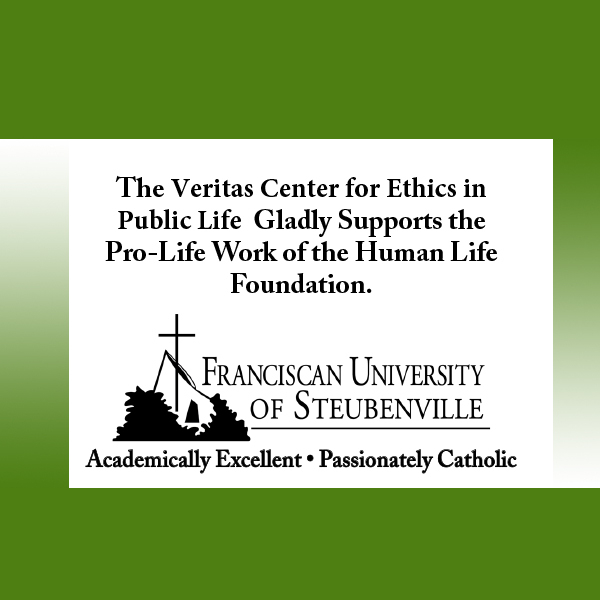 Each of these issues is a potential rallying point for the sanctity of life ethic. Once we as a nation rally around anyone of these issues to affirm the sanctity of life, we will see the importance of affirming this principle across the board. It is possible that the Supreme Court itself may overturn its abortion rulings. We need only recall that in Brown v. Board of Education the court reversed its own earlier “separate-but-equal” decision. I believe if the Supreme Court took another look at Roe v. Wade, and considered the real issue between the sanctity of life ethic and the quality of life ethic, it would change its mind once again. As we continue to work to overturn Roe v. Wade, we must also continue to lay the groundwork for a society in which abortion is not the accepted answer to unwanted pregnancy. Pro-life people have already taken heroic steps, often at great personal sacrifice, to provide for unwed mothers. I recently spoke about a young pregnant woman named Victoria, who said, “In this society we save whales, we save timber wolves and bald eagles and Coke bottles. Yet, everyone wanted me to throw away my baby.” She has been helped by Sav-a-Life, a group in Dallas, which provides a way for unwed mothers to preserve the human life within them when they might otherwise be tempted to resort to abortion. I think also of House of His Creation in Coatesville, Pennsylvania, where a loving couple has taken in almost 200 young women in the past ten years. They have seen, as a fact of life, that the girls are not better off having abortions than saving their babies. I am also reminded of the remarkable Rossow family of Ellington, Connecticut, who have opened their hearts and their home to nine handicapped adopted and foster children. I have often said we need to join in prayer to bring protection to the unborn. Prayer and action are needed to uphold the sanctity of human life. I believe it will not be possible to accomplish our work, the work of saving lives, “without being a soul of prayer.” The famous British Member of Parliament, William Wilberforce, prayed with his small group of influential friends, the “Clapham Sect,” for decades to see an end to slavery in the British empire. Wilberforce led that struggle in Parliament, unflaggingly, because he believed in the sanctity of human life. He saw the fulfillment of his impossible dream when Parliament oulawed slavery just before his death. 19,914 people have visited this page. 1 have visited this page today.